Welcome to St. Mary’s Café, where we gather as Catholics to open Scripture, share the Good News and discover God’s plan for our lives. Come on in! Explore the Catechism of the Catholic Church through Father John Hardon's in-depth commentary, the Basic Catechism Course. This 17-week study for adults is a clear, detailed exposition of the four pillars of the faith, as outlined in the Catechism: Commandments and Creed, Morality, Sacraments and Prayer. Ideal for those seeking to grow in their faith, and deepen their understanding of the beauty of the Catholic Church's teachings. This study contains solid, scriptural insights into the beauty and richness of the Catechism. "the Church never takes faith for granted, but knows this gift from God needs to be nourished and reinforced so it can continue to guide her pilgrim way." Join us! Don't miss out! 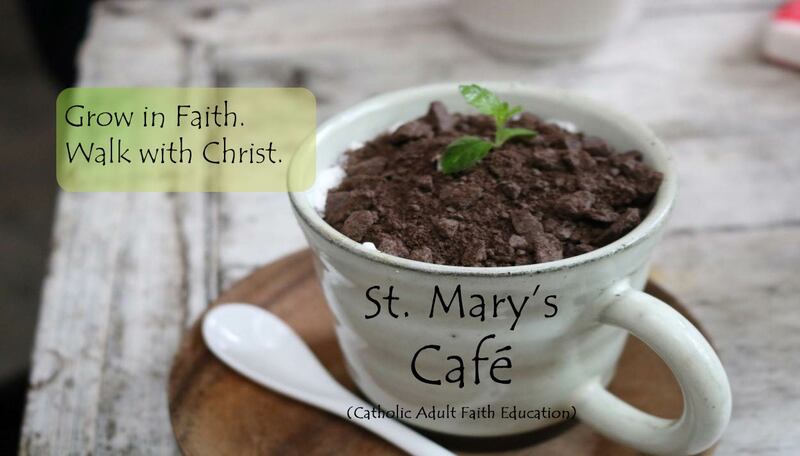 St. Mary’s Café is Catholic contemplation in a relaxed and welcoming environment with others in the parish. St. Mary's Café features a unique style of study which engages your mind, faith, experience, and imagination, leading you to read, reflect, and respond. If you've never been to a Bible Study before, or if you are an avid Bible student, St. Mary’s Café is right for you. Discover the powerful and personal truth of God's Word and practical inspiration for your life. Savor the Word, and enjoy a delicious cup of coffee!